I felt like making a spring time risotto for Hay Hay Its Donna Day #8 hosted this round by Cenzina. Two vegetables that positively squeal spring to me are fennel and fresh peas bought in their pod, so what else could I do but make a fennel and pea risotto! I am fairly new to risotto having been put off at a young age by bad gloopy porridge like stuff and instant rice risotto (remember that?! ), but I am well and truly a convert now. I bought some wonderful Carnaroli rice not so long ago and the frequency of risotto making in the house has certainly increased. I highly recommend trying the different types ; Carnaroli makes a drier risotto and Vialone Nano rice makes a creamier, starchier, risotto and also makes a great rice pudding. The Arborio rice I used to buy from the supermarket was fine, but without any characteristics to make it different from any other short grain rice. Perhaps I need to search out a better brand of Arborio . . . Put the stock in a pot and bring to the simmer adding the trimmings from the fennel, but not the fronds. Pod the peas, putting the pods in the sock and reserving the peas. Heat a large heavy pan with a knob of butter and some olive oil. When the butter has melted and the pan is hot add the onion and fennel and sauté until soft and starting to turn golden. Add the rice and turn in the onion and fennel until nicely coated with the butter and oil. Add the wine or vermouth and the Pernod and stir until the liquid is all but absorbed. Add the stock a ladleful at a time, stirring well all the time making sure each addition is absorbed, but not completely dry, before adding the next until all the stock has been used, or you judge the wetness is just right and the rice is cooked with a lovely creamy texture. Avoid adding the pea pods and fennel trimmings, perhaps straining the last amounts through a sieve. Stir the peas through the risotto so they are warmed through but still retain their fresh crunch. Turn off the heat and stir in the Parmesan and a bit more butter if you like. Serve sprinkled with the reserved fennel fronds. 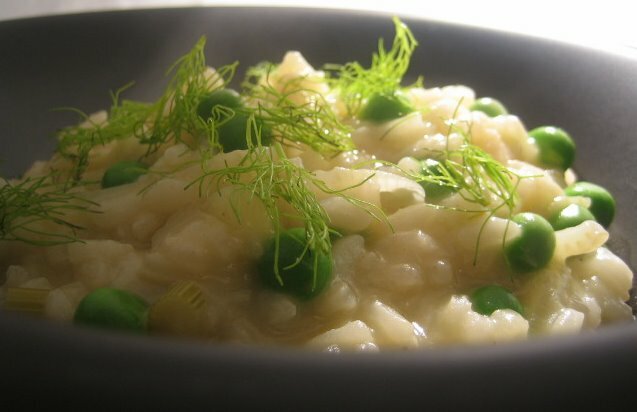 Check Cavoletto di Bruxelles for other wonderful risotto recipes that have been put together for Hay Hay Its Donna Day #8! That looks fabulous Emma. So delicate. Thanks for joining us again. What a beautiful recipe - I love your combination of pea and fennel. My local greengrocer never leaves the fronds on their fennel, which is such a shame, especially as they're so pretty. Thanks for the recipe. It was a very pretty dish. It is really sad when the purveyors cut bits off like that, I wish they would leave the leaves on the beetroot too.